Greetings, food ‘n fiction fans, and welcome to another delicious edition of Friday Feast. This week: buttery goodness, a treasure or two, plus a wonderful giveaway! First, the ridiculousness that is Us Heins Weren’t Meant To Play Golf. I’m still in Mount Gambier and have been a touch too busy dealing with Mum’s move into full-time care to play much golf, but I did head out for a few smacks on the practice fairway with Dad. Dad, bless him, had an air swing for his first shot which reminded me yet again about why I can’t play either. We also managed a round at the very picturesque Casterton Golf Club where Dad was so enamoured of all the gorgeous manna gums he kept hitting his ball at them. Playing with borrowed clubs, I wasn’t much better but at least I had an excuse for my wayward shots! With that out the way, it’s on to our guest and it’s my pleasure to welcome back rural romance author Jennie Jones whose Swallows Fall series has been delighting readers since her first book, The House on Burra Burra Lane, hit the shelves in mid 2013. Jennie has two new additions in the series coming this year. The House at the End of the Street will be out in August, but today we’re very honoured to be hosting Jennie on release day for The Turnaround Treasure Shop. Rah! And you’ll be cheering even louder in a minute when you see what Jennie has in store for us. In the meantime, check out the cover and blurb for The Turnaround Treasure Shop. It’s gorgeous! Revisit Swallow’s Fall in this short novel from Jennie Jones about an ex-military man, a single mother, and the impossibility of dreams coming true. Fatalistic, long divorced and doing her best to give her children a good life, Lily Johnson works two jobs in her hometown of Swallow’s Fall, saving every spare cent for the day she can lease the empty corner shop on Main Street. She longs to open it as Turnaround Treasures, a second-hand shop bursting with rescued country curios—but there aren’t enough spare cents and Lily’s dream is slipping away. Ex-Navy diver Nick Barton arrived in Swallow’s Fall a year ago to quietly reunite himself with civvy life. Recognising an instant attraction to Lily, Nick backed away fast. Given his track record of an unhappy ex-wife and the baggage that comes with a Special Forces career, Nick doesn’t think he stands a chance with shy, reserved Lily. He can’t be with her – but that doesn’t mean he doesn’t see her. Lily has spent her whole life cheerfully giving to others. When Nick offers her the ultimate chance for a turnaround, will Lily’s fear of being ‘second hand’ ruin the opportunity of forever love for both of them? Doesn’t that sound fun? And because today is the official release day, you can own a copy of The Turnaround Treasure Shop with a simple clickety-click. Buy now from Amazon.com, Amazon.au, iBooks, Kobo, Google Play, JB H-Fi or your favourite ebook retailer. Loaded up? Good. Now sit back and enjoy. This is lovely! It’s so lovely to be welcomed back to Cathryn’s Friday Feast. Hope you’ve got your rolling pin floured and ready to go, Cathryn. This is a shortbread recipe handed to me just after I got married. I copied it (in my terrible handwriting) into a Recipe Notebook I bought from the kitchen and garden courtyard shop at Hever Castle – the childhood home of Ann Boleyn. It was a pleasant purchase after a wonderful tour of that exception property ending with a good look at implements of torture commonly used in the sixteenth century – which were not pleasant! Hence the trip to the courtyard shop to re-charge. I’m partial to shortbread, sherry and chic afternoons although they don’t happen as frequently as I’d like. Sipping a sherry mid-afternoon seems such a contemplative, relaxing way to behave. Sipping sherry makes me think of my Nan. She always had a bottle in the sideboard and when I was old enough to move from Babycham to real alcohol, I did enjoy a sherry or two and still do. In The Turnaround Treasure Shop (a shorter length novel in my Swallow’s Fall series), my heroine is mid-thirties, long-divorced and doing her best to look after her two teenage children, work two jobs in the remote Snowy Mountains town of Swallow’s Fall and save for her dream. She taught herself how to turn shabby old country curios into sparkling new I-want-one wares and longs to open the empty shop on Main Street. So I thought it would be great to have a Friday Feast full of old-fashioned afternoon delights. Here’s my Delicate Shortbread recipe – the biscuits will be thin and crunchy to the bite but still have that buttery melt-in-your-mouth shortbread-gorgeousness – and beware, the pastry is so delicate that when you roll it out, you won’t be able to pick up the pastry to turn it once it starts to get thin. Cream butter and icing sugar very well using a mixer. The metal spoon will only do so much, so get in with your hand and knead in the bowl until all the flour has been mixed, then take half the pastry and roll out on a very well-floured surface to ½ centimetre thickness. (This pastry is soft and will be difficult to move or turn while rolling.) Use a sprinkle of flour when needed – especially on your rolling pin. Cut into preferred shapes – scone cutters are perfect, as are star and heart cookie cutters. Use metal baking spatula to slide off the floured surface and onto your prepared baking sheet. Bake in oven for 30 minutes, but keep a careful watch after 25 minutes to ensure they don’t brown too much. They should be golden in colour. Remove from oven and transfer to wire cooling racks. Sprinkle with castor sugar while warm. Enjoy with sherry, champagne, tea or coffee! Oh, I will most definitely enjoy, Jennie! Luuuuurve shortbread. The more buttery the better and this recipe looks gorgeous. Thanks so much for sharing. Well that’s an easy-peasy question for me to answer. I do LOTS of hankering for old-fashioned things, especially when it comes to food. Corned beef, pea and ham soup, a good old cream sponge or pavlova. The list is huge. Not so much for other things though. I’m quite partial to the luxuries of modern life! What about you? Do you hanker for old-fashioned things? It can be anything, your choice, and if you share we’ll pop you into the draw to win an ebook copy of Jennie’s gorgeous new release, The Turnaround Treasure Shop. Please note: Giveaway closes midnight Tuesday AEST, 26th May 2015. Open internationally. Rah! If you’d like to learn more about Jennie and her gorgeous books, please visit her website. You can also connect via Facebook, Pinterest, Google+ and Twitter using @JennieJRomance. This entry was posted in Friday Feast and tagged Australian Authors, Australian fiction, Australian novels, Australian romance authors, Australian rural romance, Australian Writers, biscuits, book giveaway, Cathryn Hein, Cooking, Food, Friday Feast, giveaways, Jennie Jones, Recipes, rural fiction, Rural lit, rural romance, shortbread, Swallow's Fall, The House on Burra Burra Lane by Jennie Jones, The Turnaround Treasure Shop, The Turnaround Treasure Shop by Jennie Jones on May 22, 2015 by Cathryn Hein. Ooh, I’m feeling just a little bit excited and giggly here in Feast Central. Why? Because rural romance royalty is paying a visit, that’s why. Yes, folks, Fiona Palmer is on the show. Yeehaa! Lara Turner has a boyfriend, a nice house in the city and a chance at a big promotion. So when her brother calls asking her to come home, she hesitates. Can she face the memories that inhabit the beloved place of her childhood? And how does she feel with the news it’s to be sold? Is she the answer to saving the family farm? Jack Morgan has memories of his own to contend with. A falling-out with his family and a bitter end to a past relationship have left a big chip on his shoulder. When his best mate’s beautiful sister arrives on the scene, he finds himself deeply conflicted. Lara and Jack have a powerful attraction but are constantly at odds. Will their love of the same land keep them apart, or grow into a love of a different kind? I am so looking forward to getting my teeth or, rather, my eyeballs, into this one! And now I bring you….FIONA! Thanks Cathryn for having me, I love reading the Friday Feast blogs. I love cooking shows too, I just don’t like cooking! I love EATING especially anything with chocolate. So you could imagine I’m loving and hating the fact that Easter is just around the corner. Easter chocolate for some reason is just yummo and the kids and hubby know that their eggs are always in danger if they sit opened in my fridge for too long. I call it the ‘mummy tax’. So for that reason I’m going to share with you a chocolate chip crunch bicky recipe my mum gave me. She told me she got it from one of my Auntie’s but when I told my Aunt about the awesome bicky recipe of hers, she had no idea what I was on about and said she’d never made them. Ha. So the whole origin of this recipe is unknown. Who cares where it came from, I’m just glad that I have it. 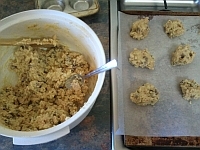 I don’t make it that often as I can’t seem to stop eating the mixture, before and after cooking! Hey, when we were kids out on the farm with my cousins we would all make a raw cake to eat, and buy the time we actually cooked what was left no one was hungry. This recipe is really simple. (It has to be for me to use it lol) Sometimes I use Cornflakes and sometimes Special K, depending on what’s in the cupboard. And once they are made, and cooled I put them in a ziplock bag and freeze them. The kids just take them straight from the freezer to eat. In summer they are really nice frozen, they don’t go hard, but are nice and cold. I just love the crunch factor. Oh and the chocolate…did I mention that bit?! Bake 180º 15-20 mins or until starting to brown. Well I hope you enjoy these as much as I do, and big thanks to Cathryn for having me. Thanks so much, Fiona. Love the way you can freeze these biscuits. Very handy and a very delicious treat in the summer I imagine. As for teenaged snack-fests, I found culinary heaven after the delivery of our first microwave. This is going to sound gross, but after school sometimes I’d come in and unwrap a whole stack of cheese slices – those really plastic-y ones because proper cheese didn’t work the same – tear them up into pieces into a cup then zap it until it turned all gooey and luscious, then gobble it up with a teaspoon. Poor Mum used to do her nut over how the cheese slices kept disappearing. In the traditions of good sisterhood, I blamed my brother. So come on Feasters, Fiona and I have shared ours, time you shared your naughty and not so naughty eaty-secrets. There’s a wonderful prize up for grabs. Entries close midnight Tuesday, 13th March. Open internationally. And please provide a way for us to contact you in case you win! If you’d like to learn more about Fiona and her fabulous books, please visit her website. You can also connect via Facebook and on Twitter. Fiona’s giveaway has now closed. Congratulations to Jenn, the lucky, lucky winner of a signed copy of The Road Home. Thanks to all who entered and for your wonderful comments. I bet there’s been a few tubes of condensed milk purchased thanks to Fiona’s visit! 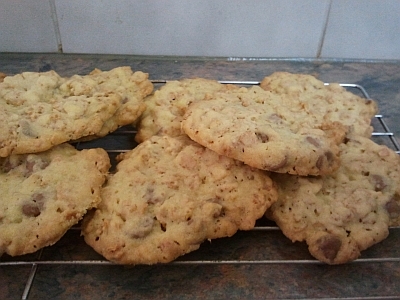 This entry was posted in Friday Feast and tagged Australian romance authors, Australian Writers, biscuits, Cathryn Hein, Fiona Palmer, Food, Friday Feast, promo, Recipes, Romance Writing on March 9, 2012 by cathrynhein.